After early footage of Mass Effect Andromeda went out into the wild, everyone latched onto Foster Addison, a character who snapped at the player because she felt tired. Addison became a running joke thanks to her blank stare and lack of emoting, which, paired with her dialogue, was pretty ironic. Thanks to the newest Mass Effect patch, she’s changed for the better. 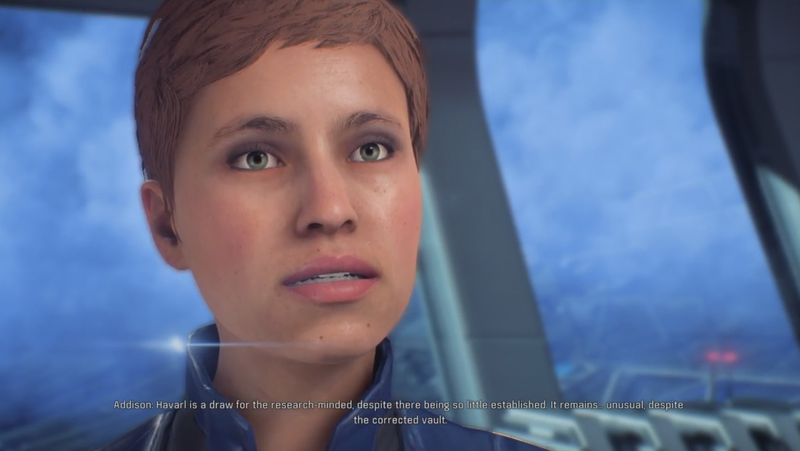 As we reported earlier in the week, BioWare promised “Improved lip-sync and facial acting during conversations, including localized [voice acting]” as well as improvements to the “general appearance” of characters, with humans in particular slated to get better eyes. As the patch dropped this morning, I booted the game up to take a closer look, and sure enough, it’s noticeable even on Andromeda’s most infamous character. As you can see below, Addison’s eyes now look slightly more human, and even her make-up shaders have improved. I’d say she’s gone from a full-on O___O to a slightly more subtle o__o. It makes a difference! She looks a bit more like a real person now. The animation still isn’t fully there, but still. This is just the first step—BioWare has promised more tweaks for down the road.